This practice is an introduction to molecular biology. This kit provides basic DNA extractions from animal tissues (chicken liver) and vegetables. The kit includes everything you need so that each student can carry out an individual practice, in the classroom itself. > Any additional equipment or material is not required. This kit allows students make an extraction of their own DNA quickly and easily from a small sample of his saliva, a laboratory microcentrifuge is not needed. 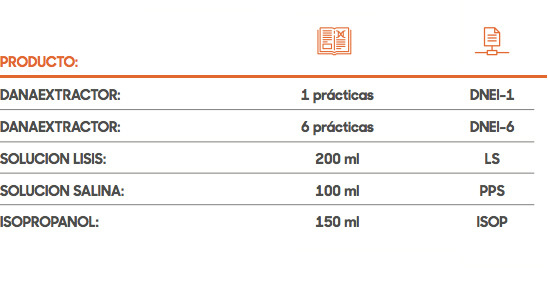 To carry out this practice the laboratory has to have 20-200 microliters micropipettes and 100-1000 microliters micropipettes and their respective tips. This material also can be supplied by BIOTED. The remaining material necessary to carry out the practice by each student individually is included in the kit. 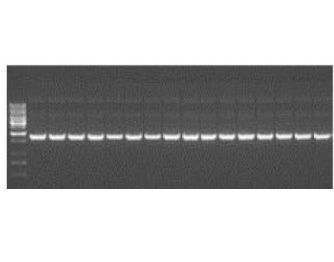 The DNA appears as a strand in the solution that the student could take home. 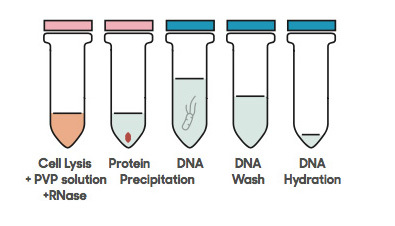 The extraction process involves cell lysis to release nucleic acids and the inactivation of cellular nucleases (DNases and RNases) to prevent degradation of nucleic acids. The purification process is the separation of the nucleic acids from the other components. Proteins precipitation with high salt concentrations. This kit allows you to isolate DNA from a saliva sample of students to obtain a quality DNA for use in PCR. Lysis solution, protein precipitation solution and DNA hydration solution. Micropipettes, microtubes, microcentrifuge, isopropanol and 70% ethanol. 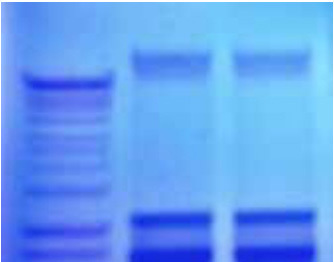 This kit allows you to isolate DNA from a blood sample to obtain a quality DNA for use in PCR. 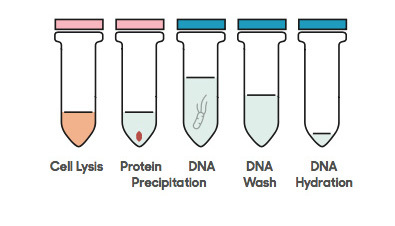 RBC solution, lysis solution, proteins precipitation solution and DNA hydration solution. This kit allows you to isolate DNA from different plants samples to obtain a quality DNA for use in PCR. Extraction buffer, lysis solution, RNAse, PVP solution, protein precipitation solution and DNA hydration solution. It is based on the adsorption capacity of nucleic acids to the silica membrane in the presence of chaotropic salts which come in small columns. We have a wide range of kits that use columns, you can visit at www.danagen.es. This kit is designed for a efficient and fast extraction of genomic DNA from high quality from a wide variety of samples including blood, cultured cells, animal tissue, mouse tails, bacteria and yeast using for this MicroSpin columns with silica membranes which selectively bind DNA. Tissues lysis buffer, lysis/binding buffer, proteinase K, disinhibition buffer, wash buffer, elution buffer, and microcolumns. Micropipettes, microtubes, microcentrifuge, incubation bath, isopropanol and 100% ethanol. This kit is designed for a fast purification of pure genomic DNA from whole blood, serum, plasma, body fluids and “spots” dried blood using Microspin columns with silica membrane which selectively binds DNA. 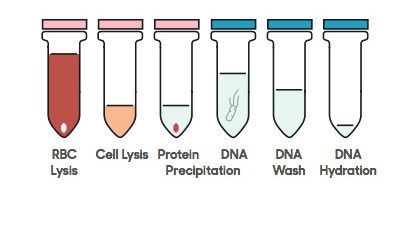 The kit uses a new formulated lysis/binding buffer specific to DNA extraction from blood samples. RBC buffer, tissues lysis buffer, lysis/binding buffer, proteinase K, disinhibition buffer, wash buffer, elution buffer, and microcolumns. This kit is optimized for a fast method of DNA extraction from paraffin-embedded and formalin-fixed (FFPE) tissues. The process omits the use of flammable and malodorous xylene and d-limonene commonly used for deparaffinization, instead own deparaffinization buffer is used for the complete dissolution of paraffin to release the tissue. Deparaffinization buffer, tissues lysis buffer, lysis/binding buffer, proteinase K, disinhibition buffer, wash buffer, elution buffer, and microcolumns. The objective of this practice is to introduce the principles of extracting chromosomal DNA from E. coli bacterial cells. Students learn the structure and function of nucleic acids containing a bacterium. Bacterial pellets, lysis solution, proteins precipitation solution and DNA hydration solution. The objective of this practice is to introduce the principles of extracting plasmid DNA from bacterial cells. Students will learn the structure and function of DNA plasmids. Bacterial pellet, resuspension buffer, lysis buffer, neutralization/binding buffer, wash buffer, elution buffer and microcolumns. Micropipettes, microtubes, microcentrifuge and 100% ethanol.